This is the scarf I made for my son last week. Now, my son is just a hair over 6 feet tall or if you count his hair, 6'3" and most of his height seems to be in his long waist. Which means that for him, this scarf had to be at least 6 feet long or it would look miniaturized and very short. If you're a beginning crocheter, basketweave uses some techniques you may not have tried yet. It looks like it's all switched and turned to crochet, but it isn't, it's crocheted back and forth using front and back post crochets to create the effect. Front post double crochet (abbreviated fpc)- yarn over, insert the hook from the FRONT of the fabric behind the post of the stitch and back through the other side of the post. Yarn over, pull loop through, yarn over, pull through 2 loops, yarn over, pull through 2 loops. 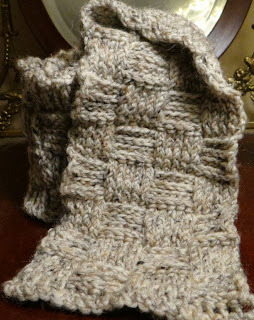 Back post double crochet (abbreviated bpdc)- yarn over, insert hook from the BACK of the fabric behind the post of the stitch and back through the other side of the post, yarn over, pull loop through, yarn over, pull through 2 loops, yarn over, pull through final 2 loops. Because this is worked flat, to make the squares you'll be working fpdc in bpdcs and vice versa. worsted weight yarn- about 522 yards at a guesstimate. I used just under 1 and half skeins of Lion Brand Fisherman's Wool in Birch Tweed for the scarf shown above. Row 2: ch 2 (counts as first stitch), dc in each stitch across. The switches to the next set of "blocks" are every 4 rows. Repeat rows 6-13 25 more times for a scarf that's just about 6 feet long. You can make it longer or shorter, just end it at the end of one of the 4 row block sections. End it with a row of single crochet. Break off yarn. Weave in ends. My son LOVES this scarf so much. He tried to take it before I got photos or did my final count to see how many repeats it took to make it long enough. If I use your pattern may I sell what I make? Absolutely. I hope it sells well for you. Thanks for the pattern. I think my husband will love this scarf!